Ex-BTA Bank top managers plead guilty to embezzlement | Russian Legal Information Agency (RAPSI). 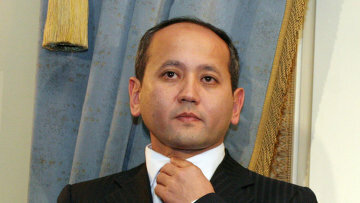 MOSCOW, April 3 (RAPSI) – Former top managers of the Kazakh BTA Bank involved in a criminal case against bank’s ex-chairman Mukhtar Ablyazov have pleaded guilty to embezzlement, RIA Novosti reported Monday. Their trial has begun in the Specialized Criminal Interdistrict Court of Almaty. Three former top managers of the bank, ex-Chairman of the Board Saduakas Mamesh, former First Deputy Chairman of the Board Zhaksylyk Zharimbetov and ex-Director for Lending Issues Kairat Sadykov are in the dock. Ablyazov is being tried in absentia. On Monday, prosecutors read indictment claiming that Ablyazov had organized a criminal group to embezzle BTA Bank’s funds. According to prosecution, companies controlled by Ablyazov purchased the bank’s shares on money from loans illegally received from the bank. Therefore, Ablyazov and his accomplices “increased the bank stock.” The increase in the bank's capital gave the appearance of BTA Bank’s success and enticed investors and depositors, prosecutors believe. As reported earlier, the total amount of damage caused exceeded $7.5 billion. Zharimbetov pleaded guilty to charges, while Sadykov and Mamesh pleaded guilty in part. Interestingly, Ablyazov also stands charged with embezzlement, forgery of documents and abuse of office in Russia. He has been arrested in absentia. BTA Bank ex-chairman fled to the UK after the Kazakh government acquired a stake in BTA Bank in 2009 and the bank came under the control of its sovereign wealth fund Samruk-Kazyna. His whereabouts remained unknown until he was detained on July 31, 2013 near Cannes, France. Kazakhstan, Russia, and Ukraine are all seeking his extradition. In October 2015, French authorities approved Ablyazov’x extradition to Russia. In December 2016, French Conseil d'État, highest administrative government body, overruled prime-minister’s decision to extradite Ablayzov and released the tycoon from jail. 11:38 03/04/2017 Former top managers of the Kazakh BTA Bank involved in a criminal case against bank’s ex-chairman Mukhtar Ablyazov have pleaded guilty to embezzlement.